The Doubleclicks (http://thedoubleclicks.com/) are two sisters who sing sincerely about the things geeks love: dinosaurs, super-villains, Dungeons & Dragons, and more. The duo has gained renown for their youtube videos including the geek girl song “Nothing to Prove,” for appearing on Wil Wheaton’s web show Tabletop, and for writing the theme song for Cards Against Humanity. The Doubleclicks have toured conventions, bars and clubs across the US and Canada including at w00tstock, Comicon and JoCoCruiseCrazy. Their 2013 album “Lasers and Feelings” hit the top 10 on Billboard’s comedy charts. Their 2014 album “Dimetrodon” features songs about burritos and cats and was funded by an $80,000 Kickstarter project. 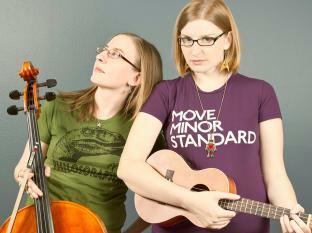 Doubleclicks concerts are perfect for fans of cellos or the 1995 BBC Pride and Prejudice mini-series.